’Tis the season to be jolly. There’s no better way to express your holiday cheer to your neighbors than by hanging holiday lights on your house. Exterior lights can be fun for your whole family and neighborhood, but they often come with some risks. Every year, people injure themselves or others while hanging exterior holiday lights. If you want to minimize risks, follow our guide for hanging holiday lights. Nobody wants to spend an evening in the emergency room during the holidays or have a leaky roof on Christmas morning. If the damage is already done and you need repairs completed on your roof to ensure that your holiday plans are not derailed, call your Top Rated Local® Nashville roofing contractor Tim Leeper Roofing at 615-553-2782. Before you even think about climbing a ladder, make sure you have the right equipment for the job. In addition, check to make sure all of your lights are working. Whether they flash to the tune of “Jingle Bells” or animate Santa Claus taking off from your roof, always plug them in before hanging them. There is nothing worse than taking down lights because of a few burnt-out bulbs. While you are checking the lights, be sure that you have all the necessary extension chords and outdoor power supplies — we don’t want you running an extension cord through the interior of the house by way of the doggy door. Avoid using old extension chords that have worn-out insulation. Making sure you have a safe and secure power supply for your holiday lights will minimize the risk of electrical failure or fires. If the eves on your house are low enough, you might be able to hang your holiday lights with a step ladder. If not, be sure to procure a single-pole ladder. When securing the ladder, place it on a non-slip surface like dry grass. This is difficult to achieve in winter, but it is important. Tying the ladder to a fixed object is advised, along with using a buddy to hold the ladder in place to prevent slippage. Now that you are adequately prepared and have taken safety precautions, it is time to hang the lights. When standing on the ladder, be sure to keep your weight centered. Do not overextend yourself, as this will change the center of gravity on the ladder and you will start tipping. Do not stand on the top rungs of the ladder. If you follow these basic ladder safety tips, you should not be at risk of tipping over. As you ascend to the highest mount—of the ladder, that is—the rookie move is to immediately reach for the staple gun and start stamping your lights into the roof. DO NOT reach for the staple gun. Puncturing holes in the roof surface, especially on shingled and flat roofs, will allow moisture to leak into the holes and damage your roof. Instead, try using some clips that attach to either your gutters or eves. These non-invasive clips are fairly inexpensive and will help increase the longevity of your roof. Another added benefit of using clips is that the lights will hang safely away from your roof. In the off chance that there is an electrical problem or the lights overheat, you don’t want them sitting directly on your roof. As long as you follow the safety protocol for hanging your exterior holiday lights, you will be left with an amazing light display that will be sure to turn heads in your neighborhood. 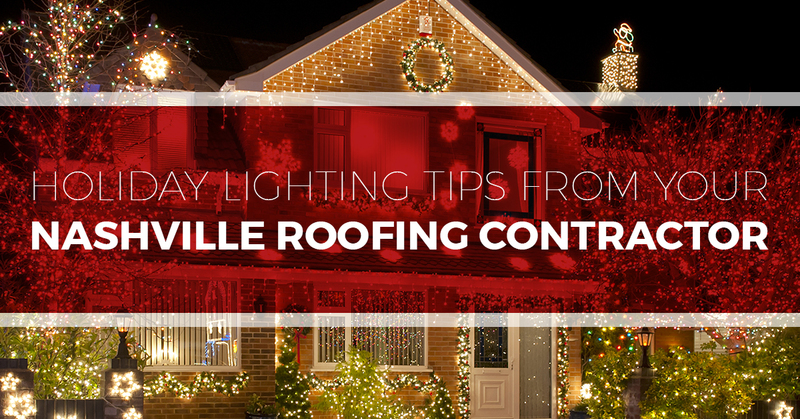 Attaching lights to your roof is a dazzling way to get into the holiday spirit, but be wary of nailing or stapling the lights directly to the roof. If the damage is already done, or you are noticing some water ponding on your roof while you’re up on the ladder, it is never too late to have your local Nashville roofing contractor inspect your roof. The last thing you want on Christmas or New Year’s Eve is a leaking roof. Don’t take any chances this year, and call Tim Leeper Roofing for a roof inspection at 615-553-2782.